The tribe of Bajīla formed one-fourth of the army which fought the Battle of al-Qādisīya. When a man of the Thaqīf, who deserted to the Persians, informed them that the Bajīla tribe are the most dangerous, the Persians confronted the Bajīla fighters with 16 elephants, while against all the rest only two were deployed. Abū Thawr, ʿAmr b. Maʿdīkārib [sic], however, encouraged his men saying: O you associates of the Emigrants! Be like lions! The Persians are like a roe-buck against a spear and their cavalry cannot attack. I called out: Rely on God O Abū Thawr! And then I saw how a Persian threw his spear at him but hit his horse, and how ʿAmr attacked and slaughtered the Persian like a lamb, taking away from him two golden bracelets, one embroidered coat and a golden belt. After the enemy was vanquished a quarter of al-Sawād was given to the Bajīla tribe and they possessed it for three years. When Jarīr visited ʿUmar b. al-Khaṭṭāb he said to him: O Jarīr, I am responsible for the distribution of the lands, and I think that your land should go back to the Muslims as a whole. Thereupon Jarīr caused the lands to be vacated and ʿUmar granted him a stipend of 80 dinars. ʿUmar gave to Jarīr and his tribe [of Bajīlah] the fourth part of the Sawād and they held it two or three years. Then Jarīr went visiting ʿUmar together with ʿAmmār [b. Yāsir]. ʿUmar said to him: Oh Jarīr! Were I not responsible for the division (lawlā innī qāsim al-masʾul), you would be left as you are, but I think you should give it back to the Muslims . So they returned it, and ʿUmar gave them 80 dinars. Source: Yaḥyā b. Ādam, Livre, 29 (Arabic); English translation from idem, Taxation, 42§109. On the battlefield of al-Qādisīya, we were one-fourth of the people, so ʿUmar gave us the fourth part of the Sawād and we held it for three years. Then Jarīr went to visit ʿUmar who told him: By God! If I were not the one responsible for the division, you would be left on what was allotted to you, but I think you should return it to the Muslims. This (Jarīr) did. ʿUmar allowed him 80 dinars. Source: Yaḥyā b. Ādam, Livre, 29 (Arabic); English translation from idem, Taxation, 42§110. ʿUmar said to Jarīr: Would you like to go to al-ʿIrāq if I allow you a fourth or a third of the land and everything, after the ‘fifth’ (has been deducted)? Source: Yaḥyā b. Ādam, Livre, 29 (Arabic); English translation from idem, Taxation, 42§111. ʿUmar gave (the tribe of) Bajīla the fourth of the Sawād. They held it for two years. Then Jarīr visted ʿUmar. The latter told him: If I were not the one responsible for the division, you could stay on what was allotted to you, but I think you should return it . And Jarīr returned it, and was allowed 80 dinars. Source: Yaḥyā b. Ādam, Livre, 29 (Arabic); English translation from idem, Taxation, 42§112. 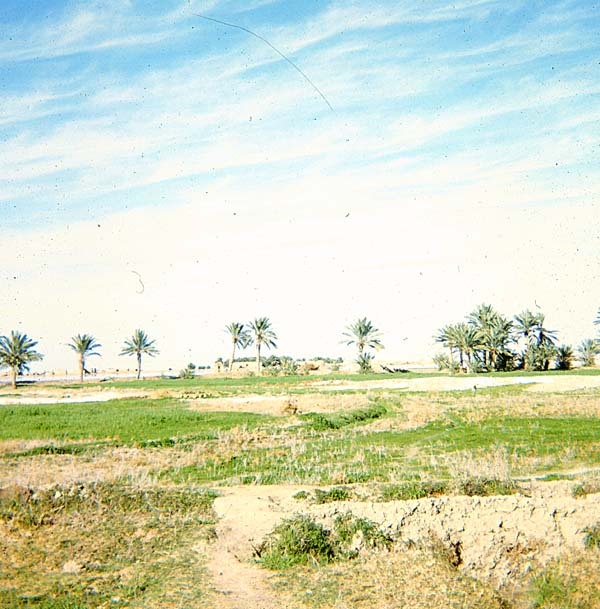 A well in the Sawād area of south-central Iraq. 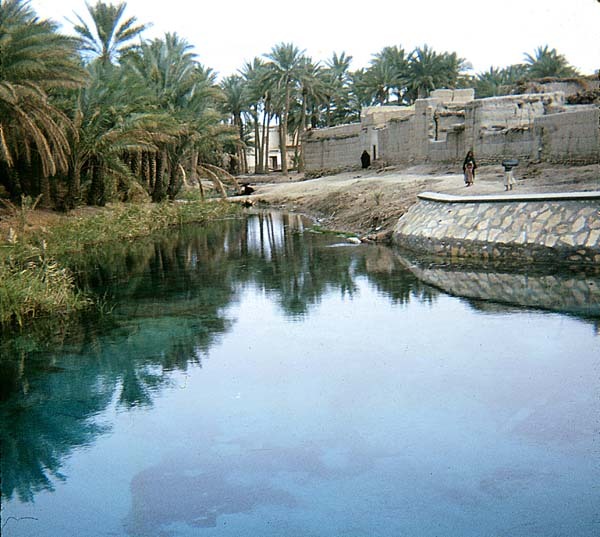 Source: University of Michigan Museum of Anthropology: Mesopotamian landscapes. 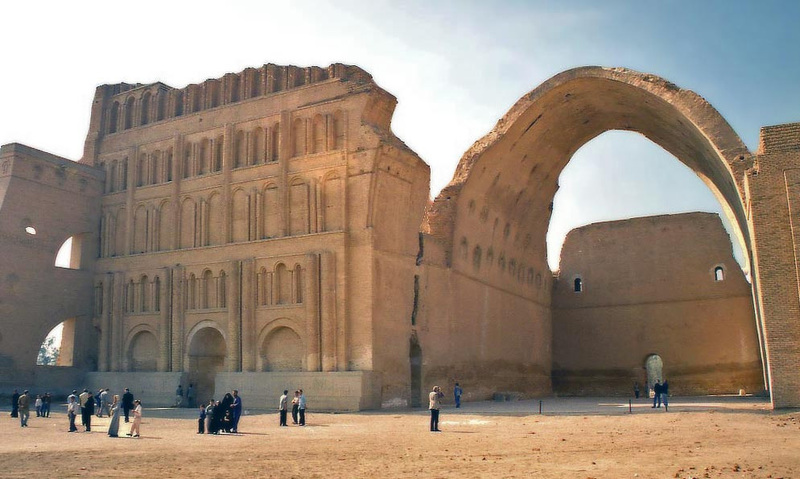 Ruins of the royal palace (Ayvān-e Khosrow) in Madāʾin (Ctesiphon), the Sāsānian capital. Source: Wikipedia. 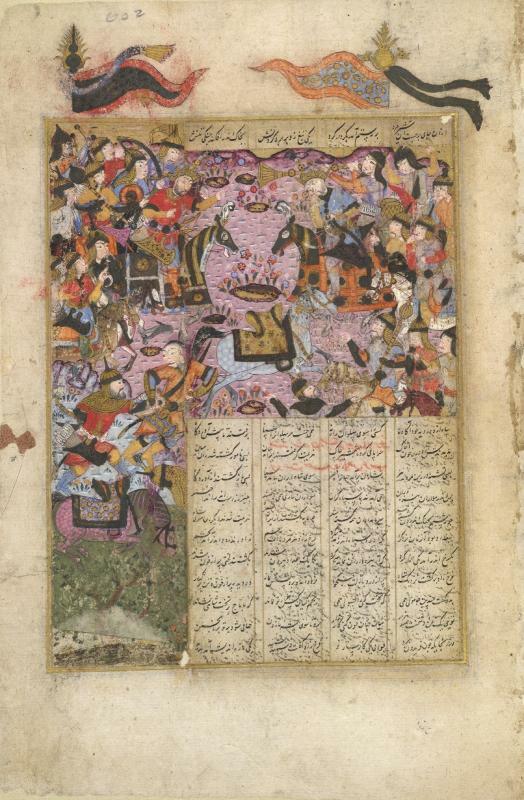 Depiction of the Battle of al-Qādisiyyah from a manuscript of the Persian epic Shāh-nāmeh. Source: British Library (MS. I.O.Islamic 3265 (1614) f. 602r).